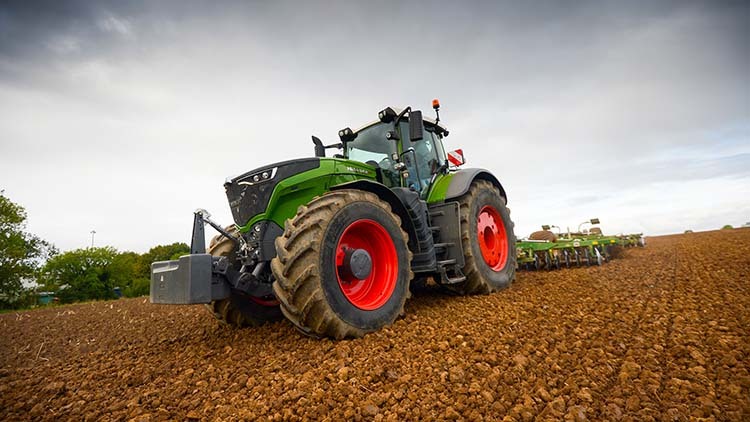 On-test: Can Fendt's 1050 Vario get the power down? After delving deep into the theory and technical side of the new Fendt 1000 Vario series tractor last year, now we try it out in the field. James Rickard takes it for a test drive. Sporting Fendt's new 'nature green' livery, can the 1000 Vario Series cut it in the field? So rarely these days do new tractor developments create such hype and fervour, but the launch of the Fendt 1000 Vario Series last year was certainly an exception. To recap, the development of the 1000 Vario Series follows the manufacturer’s identification of a gap in the market between conventional tractors, which currently have a tendency to top out at about 400hp, and where 17-tonne-plus tracked and articulated machines take over. Take a look at the engineering behind the Fendt 1000 Series. Four models make up the new series: the 380hp 1038, 420hp 1042, 460hp 1046 and the range-topping 500hp 1050. The latter being our test subject. 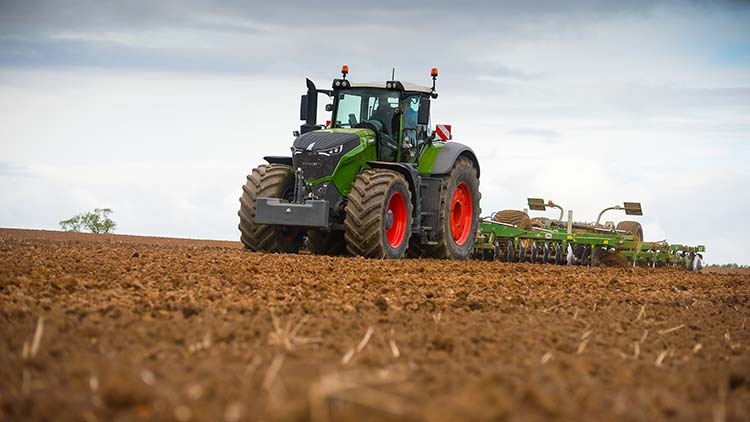 With much of the new tractor’s development focussed around a low revving engine concept, coupled to a brand new Fendt transmission, we were keen to see what it was like in-field. More importantly, is a conventional tractor capable of transmitting 500hp to the ground? To get an impression of the Bavarian beast, we headed to the field armed with a Great Plains tillage train comprising a 6-metre set of large dimeter heavy discs, along with the firm’s CultiPress. Rated engine speed of the MAN powerplant is a lowly 1,700rpm, but more astonishing is the 2,400Nm of torque which is available between 1,100rpm and 1,500rpm. While moving a lot of soil with the tillage train, the engine was not particularly taxed, purring away quite happily at 1,350rpm, resulting in a 10kph (6mph) working speed. In addition, the use of a variable geometry turbo offers little turbo lag, while keeping power levels up. On the emissions front, the MAN motor uses a combination of selective catalytic reduction and external exhaust gas recirculation to meet Stage 4. Thanks to the engine’s low revving characteristics, it does not need to use a diesel particulate filter or diesel oxidation catalyst. There is also a noticeable ‘gap’ under the bonnet, which will eventually become the home of a diesel particulate filter when the tractor has to make the migration to Stage 5 emissions requirements. The tractor’s new TA 400 continuously variable transmission is capable of a maximum speed of 60kph (37mph) at 1,450rpm – 40kph (25mph) is achieved at 950rpm. Like the 900 Series, it comprises one hydrostatic pump and two hydrostatic motors. However, in the 1000’s case, one of the motors drives the rear axle, while the other one drives the front axle, so there are no range changes to make. Above 25kph (15mph), drive to the front axle disconnects. At top speed, drive is completely mechanically transferred to the rear axle. From the hydrostatic pump, oil is free to take the path of least resistance to either of the two motors. As we found in the field, this gives the benefits of no transmission wind-up, with no hindrance to turning circle – a turning circle which is not bad for a tractor of this size. But if the tractor detects too much difference in axle speeds, above 5 per cent, a mechanical four-wheel drive lock will kick in automatically. Transmission is good to use and offers a lot more refinement and control over speed compared to clunking your way through a powershift. Interestingly, it is likely this new transmission design will filter down through the Fendt tractor family. 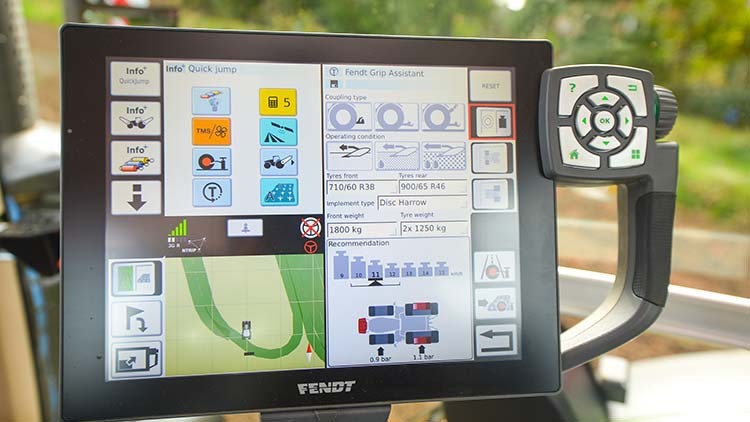 To get the power down, Fendt has developed a system to help operators get the most out of the tractor. Called Grip Assist, it can be accessed through the Vario terminal and advises how much ballast is required, where to distribute it and what tyre pressures you should use. It bases this on the job being carried out, tyre sizes and working speed. Like many systems of this ilk, it works to an extent and gets you close to where you want to be with settings, but skill is required to get the best combination of ballast and tyre pressures. In combination with the firm’s Vario Grip option, it allows tyre pressures to be altered from the cab, on the go via an on board compressor. The latter also provides air for the tractor’s seat. With tyre pressures set to 0.9bar in the fronts and 1bar in the rears, along with 2,500kg of rear wheel weights and 1,800kg of front ballast, the 1050 seemed to put power down well. Wheel slip varied from 10 to 15 per cent. Unlike a tracked tractor, is does take a bit more thinking about when setting it up for heavy cultivation duties. For the operator, the new X5 S cab is essentially a larger version of the 900 Series cab. Space is plentiful and the leather seat option finishes it off a treat. 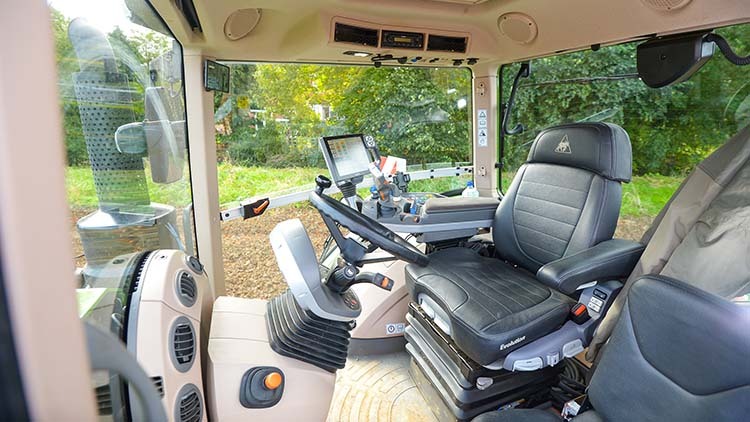 Unlike crawler or articulated cab positions, which tend to be quite lofty, this feels a lot more like you are sat in the tractor rather than on it. While this feels a very stable position, it does mean all-round visibility is slightly compromised, particularly forward views which are dominated by a bonnet capable of easily accommodating a Subbuteo match. 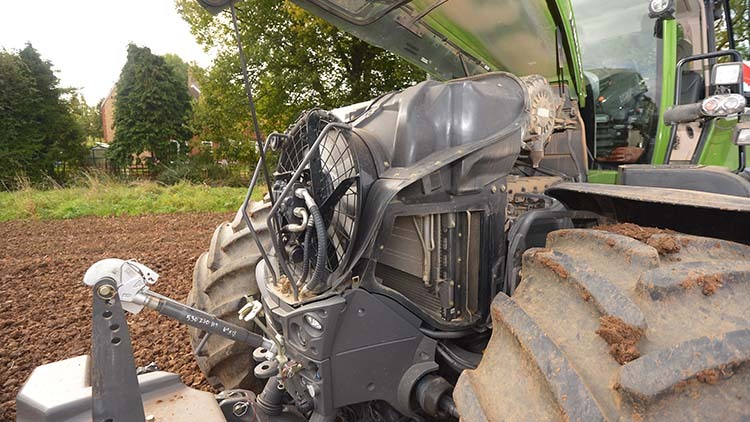 It is only by the grace of a camera mounted under the Fendt badge that the front linkage can be seen. Pretty much the same operating logic and control layout is employed, except for the missing range change and four-wheel drive selection buttons, as the former does not happen any more and the latter is automatic. In addition to the manual handbrake, an automatic handbrake is now included, which applies when the tractor comes to a complete stop and releases when the accelerator pedal is pressed. For comfort, the 1000 employs four-point air cab suspension, as well as double wishbone, independent front suspension. From an engineering point of view, this tractor is impressive. Not just a beefed up 900 Series, it is new from the ground up, employing a clever and impressive powertrain. However, potential customers should not be under any illusion that this tractor is a direct replacement for an equivalent-powered tracked tractor, as it will never quite be able to put its power down like a crawler. But it is not far off and should be a lot more versatile. Jobs we see it being good at include drilling, where high speed is key to keep up quality of work, and transport duties, such as grain carting with a chaser bin and slurry tanking on an AD plant, for example. So who would want one? We can certainly see it appealing to some of the smaller crawler users who want something more versatile to carry out more than one or two jobs. In addition, users running tractors such as Case IH Magnums, John Deere 8Rs and Fendt 900s may also be candidates who want to trade up the power scale. It is also quite conceivable the tractor could be a replacement for two machines – one which would be the heavy cultivations machine. Finally, yes it does look a beast, and yes the new ‘nature green’ colour does grow on you. Previous: Can we learn to farm without antibiotics?